The European Power Station is a global power company that owns and operates a diverse and growing portfolio of electricity generation and distribution businesses, which provide reliable, affordable energy to customers in 27 countries. The power plants encompass a broad range of technologies and fuel types, including coal, diesel, hydropower, gas, oil, wind and biomass, providing power to several diverse markets, from São Paulo to Indianapolis. Major inspections were required to their G2 & G1 Generators and Quartzelec were successful in securing the contract to support E.ON Power Engineering Services as the main contractor as the tender was successful against others on the basis of best value and least outage time.The generators are both hydrogen cooled with water cooled stators, 300MW, 17,000V and 3 ph. For both generators, initial inspections and tests were carried out, including hydrogen gas leak tests, air tests and visual inspections. Results identified leaks in various parts of the generator and other areas that required maintenance. Work commenced by dismantling the generator and isolating its associated controls. The No. 4 pedestal was disassembled, checked and serviced, parts were replaced and then reassembled. The exciter was removed for an off site overhaul and once completed, was reassembled and connected mechanically and electrically. The generator was then disassembled, removing brush gear and assemblies, bearing covers, casing inspection doors and the rotor. The rotor was transported to the Quartzelec Rugby workshop where the interpole connection was replaced along with the retaining rings. The turbo end retaining ring was not removed but was inspected using a zyglo dye penetrant and ultrasonic examinations. 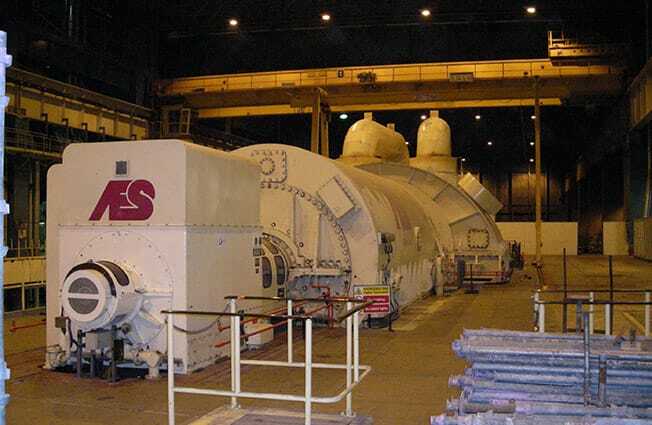 A stator core test was conducted to identify any potential damage to the lamination and insulation, El Cid tests of the stator were undertaken and the stator coil nozzle was inspected using a Boroscope. The hydrogen seals were renewed and the bearings were checked and replaced. Camera inspections took place and once complete, the rotor was suitably packaged and shipped back to site where it was re-installed and the generator was reassembled. Finally, various tests were conducted including RSO tests, stator insulation wedge tests for tightness, generator stator and core inspections and tests, stator winding overhang check, stator water system checks, pressure tests, rotor search coil tests, PI, IR, Tan Delta and Partial Discharge Tests. The tests were found to be within limits and both units were commissioned and put back into normal service.